Punalu'u means “diving spring.” The villagers that used to live near this beautiful black sand beach would dive into the ocean looking for one of the many submerged offshore freshwater springs. The diver would put a thumb over the opening of a water bottle, and then they would fill the bottle at the mouth of the underwater spring to return with fresh drinking water. If you dare to dip into the ocean on this gritty beach, you just might feel the cold water rushing out from one of these springs. This popular beach is said to have a curse. Anyone who dares to take a black volcanic rock from the beach is stuck with bad luck by the Hawaiian god Pele. The curse is only lifted once the rock is returned to the beach. You can even see a display case with mailed-back volcanic rocks at the entrance of the beach. It’s entertaining to read the letters that accompanied the rocks, and it’s even more entertaining when you learn the curse was made up by park rangers back in the 1950’s. They simply wanted to preserve the beauty of the area. This is an incredibly popular beach on the southeastern coast of The Big Island. 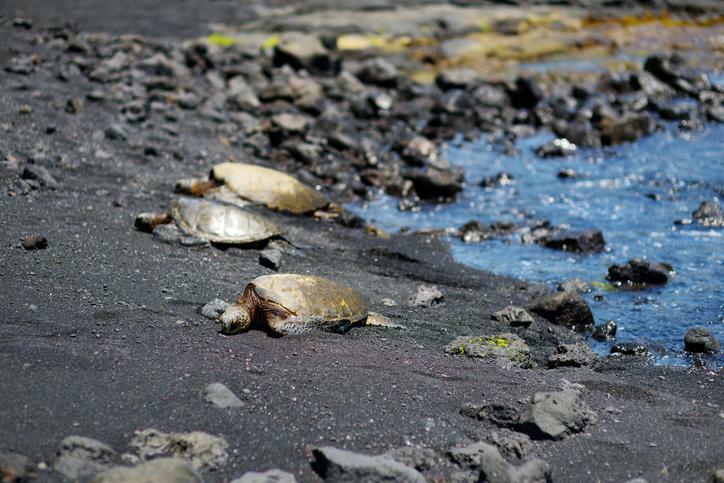 It’s popular for its jet black sand, but it’s equally popular for the playful sea turtles that like to lounge on the beach. You’ll notice that the sand is quite gritty underfoot. 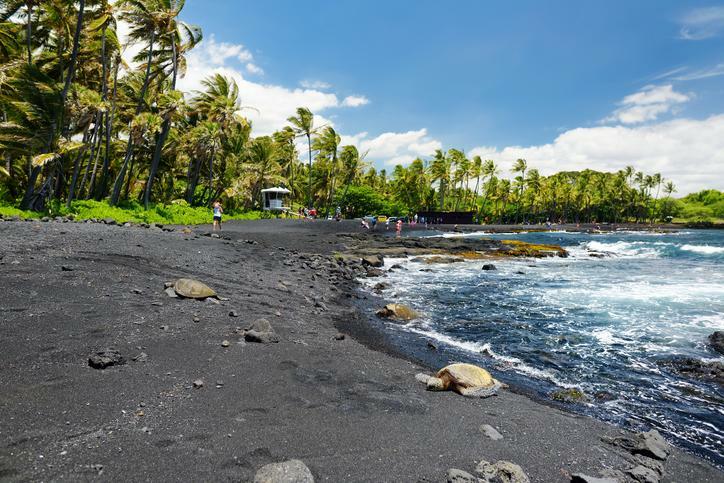 After all, the black sand beach is made up of crushed volcanic rock, and it can be quite sharp. That’s why it is so amazing to watch the sea turtles sleep on this bed of nails. Just make sure to wear sturdy shoes when you visit, or you’ll be uncomfortable while you try to snap those selfies. Make sure to keep at least 15 away from any sleeping sea turtles. The turtles are not equipped to handle human infections, and the oils from your skin can degrade the animal’s shell which will certainly lower its life expectancy. Plus, it’s illegal to touch turtles in Hawaii, and locals love to assist police officers in enforcing the law. It’s a costly ticket. Watch where you’re going when you take that selfie, and keep your distance. The beach is a stunning contrast in color. The usually brilliant blue of the ocean is muted with black sand lurking underneath the waves, but the deep black of the sand stands in stark contrast to the verdant green of the surrounding trees. And you’ll be amazed at just how well the turtles blend in with the sand during your visit. You’ll be wondering if they are actually green after all. Punalu'u Beach used to be a hub for the transportation of goods, but the advent of roads and cars killed the commercial port. You can still find the remnants of an old pier on the northeastern side of the bay next to a new boat ramp. This is the most comfortable spot to enter the beach as the black sand is less gritty, but don’t go into the water near the pier. There is a notorious rip current that can take you out to sea on the northeastern side of the bay. The surrounding villages have been struck by tragedy over the years. The first recorded tsunami took place in the mid-1800’s, and it swept most of the villages away. Two subsequent tsunamis, in 1960 and 1975, have eroded this beautiful beach dramatically. This is a beach to stay away from if there are tsunami warnings for the Big Island. At one of the beaches, you’ll find a cool freshwater pool that’s perfect for a dip. It’s fun to bring kids to this beach to see them marvel at the sea turtles and the freshwater pool. This pool is fed by one of the many freshwater springs in the area. Most of the others are submerged just off the shore. You’ll be driving quite a ways from either Kona or Hilo to get to this spectacular landscape. You can find the beach on the southeastern side of the island in between mile markers 55 and 56 on Highway 11. Simply turn towards the ocean, and you’ll see the parking lot.